cubatravel has been a member since February 27th 2014, and has created 17 posts from scratch. Cayo Guillermo’s larger neighbor Cayo Coco has a lot to offer and, while beaches such as Playa Pilar are arguably better on your island, Cayo Coco has other attractions worth seeing. The every 30 min shuttle bus from Cayo Guillermo costs just 5 CUC per person or a taxi will set you back 25-30 CUC which is evidently dividable between the occupants if you decide to go as a group. The Horseback riding tour in Cayo Coco is ideal for both novices and seasoned riders. There’s no galloping to speak of and the whole trip is taken at a trotting pace. More about Cayo Coco Horseback riding. If you are looking to start Kitesurfing or, are already experienced in the sport, the Kiteland Park Cayo Guillermo offers all the equipment and training you’ll need. Unlike other locations, Cayo Guillermo’s tranquil waters and gentle breezes perfectly lend themselves to picking up this exhilarating sport. Novices can be up and surfing within 20 minutes, propelled across the crystalline waters while taking in this beautiful Caribbean scenery. We would say that Cayo Guillermo is probably one of the best places to give this a try, the combination of a shallow sandy bottom, light winds, warm waters and pleasant surroundings, make it an ideal starting point. Don’t be afraid to give this a try, it’s not as difficult as the pros make it look and can be an amazing adrenalin boost besides being great fun. The Kiteland Park Cayo Guillermo Kite Training School is located at the Hotel Allegro Club Cayo Guillermo, short lessons start at just 5 CUC up to 20 CUC per hour. 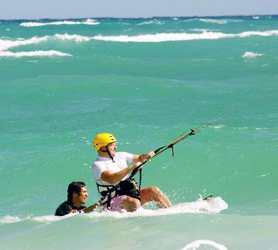 For experienced Kiteboarders, a one hour session with all-inclusive rental and equipment is 30 CUC, a true steal. The techniques acquired can also be used later on the resorts catamarans to both get you out to sea and more importantly, back to the beach. The Green Moray is an International Scuba Diving Center located at the Melia Cayo Guillermo Hotel. The dive center prides itself on professionalism using new Scubapro equipment and very experienced guides. Green Moray dives range from 30 meters in depth, to shallower excursions at 10 meters on the Cayo Guillermo Barrier Reef. At these depths, on the Atlantic side of the reef, it’s easy to interact with and see; Turtles, Barracuda, Nurse Sharks, Sting-Rays, Moray Eels, Lion Fish apart from the abundant untouched coral and sponge growth. A five dive package runs out at 180 CUC all-in, including equipment, dive suits and all ancillary costs. 10 dives is a very reasonable 310 CUC. For beginners there’s the initial pool experimentation at the Melia Pool and then one dive which costs 35 CUC. Cayo Guillermo inaugurated its eco friendly dolphinarium in 2013 and it was designed to entertain tourists spending their vacations in Cayo Coco or Cayo Guillermo is the Jardines del Rey archipelago. The Cayo Guillermo dolphinarium offers gastronomic services and educational tours to see these sea mammals in action. It is a dream of many people to interact with dolphins and this is now possible in Cayo Guillermo, either main platform at the park or in the water with the dolphins. Three dolphins have been expertly trained to push, pull and numerous acrobatic drills by professional staff of 4 dolphin specialists. The dolphinarium is managed by the company Palmares S.A. that also runs three other dolphinariums on the island, one in Varadero, one in Cienfuegos and one in Santiago de Cuba. The dolphinarium is located near the Marina in Cayo Guillermo and easily accessible from all 4 hotels and the price is 20 CUC for adults and 5 CUC for children. 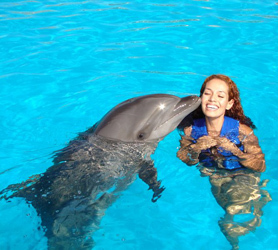 The Cayo Guillermo Dolphinarium Dolphin show is extremely well choreographed and the whole session of swimming and petting the dolphins a brilliant addition to any vacation. The Jardines del Rey archipelago is a ribbon of practically untouched islands and islets which lie 20 to 60 km from the Cuban mainland, on the islands northern coast, spanning 250 miles (400KM) all along Cuba’s north coast. 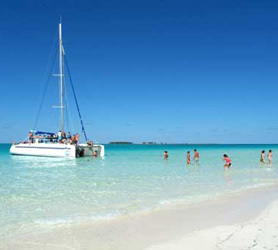 Essentially, the reef begins at Cayo Blancos, Varadero and ends at Cayo Sabinal in the Sabana-Camaguey archipelagos. The part of the reef pertaining exclusively to Jardines del Rey is 125 miles (200km) long. As the world’s second largest barrier reef, trumped only by the Great Barrier Reef in Queensland Australia, its gigantic extension of coral reefs has been both a peril to ships for over two centuries and, a unique attraction for divers and leisure enthusiasts since 1993, when the first hotel was built on Cayo Guillermo. 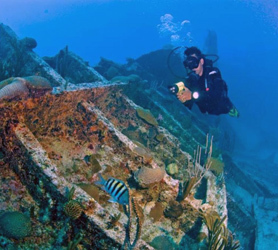 Shipwrecks, underwater caves and amazing marine life abound throughout the whole reef. The areas between the beach and the beginning of the reef are typically shallow waters, naturally protected by the reef wall on the Atlantic side, ideal for snorkelers exploring the coastal side of the reef and scuba divers on the deeper Atlantic side of the reef. 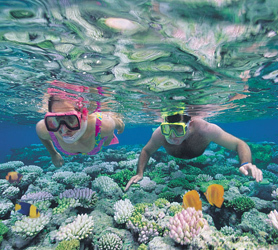 Smaller fish and, those species in breeding season, will move across into the shallower waters for protection, making the spectacle for snorkelers absolutely unique. The Atlantic side of the reef is typically populated by larger fish and sea mammals such as whales and dolphins. Common to most of the Caribbean, the reefs are teeming with life and vibrant corals, making any snorkeling or diving experience unforgettable. The reef serves as a wall of protection, not only for the beaches but, also bathers in the area, quelling high seas and waves as it acts as natural breakwater while also keeping larger fish and predators out of the shallower coastal side of the Reef. Larger fish, sharks and mantas that attempt to cross from the Atlantic side into the shallower coastal waters find themselves either impaled on the fast petrifying coral or slashed by its razor like edges as they traverse. It is not uncommon to see the smaller fish feeding off these dead carcasses of larger fish that have made the fatal mistake of trying to pursue a meal that little too far over the reefs ledge, finding it impossible to switch back and invariably being cut and succumbing to the wounds on the coastal side.